With a stay at Clarion Inn & Suites Kissimmee-Lake Buena Vista South in Kissimmee, you'll be within a 10-minute drive of Old Town and Medieval Times. 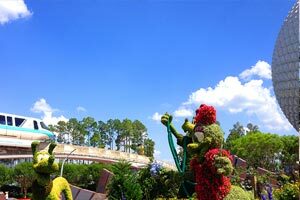 This hotel is 3.4 mi (5.5 km) from Walt Disney World® area and 5.3 mi (8.6 km) from Walt Disney World® Resort. Make yourself at home in one of the 154 air-conditioned rooms featuring refrigerators and LCD televisions. Wireless Internet access (surcharge) keeps you connected, and cable programming is available for your entertainment. Private bathrooms with shower/tub combinations feature complimentary toiletries and hair dryers. Conveniences include microwaves and coffee/tea makers, as well as phones with free local calls. Enjoy recreational amenities such as a spa tub and a fitness center. Additional amenities at this hotel include wireless Internet access (surcharge) and tour/ticket assistance. At Clarion Inn & Suites Kissimmee-Lake Buena Vista South, enjoy a satisfying meal at the restaurant. A complimentary buffet breakfast is served daily. The preferred airport for Clarion Inn & Suites Kissimmee-Lake Buena Vista South is Orlando, FL (MCO-Orlando Intl. ).